"Pilates has the perfect recipe to keep you in shape throughout every trimester," Gianni says. "Not only will it keep you strong and flexible, but it's the perfect antidote to the discomforts associated with your pregnancy." The (big!) added bonus? Because Pilates work engages your deepest core muscles, pelvic floor, hips and spine, you'll develop muscle strength and memory that will help your body recover faster post-pregnancy. 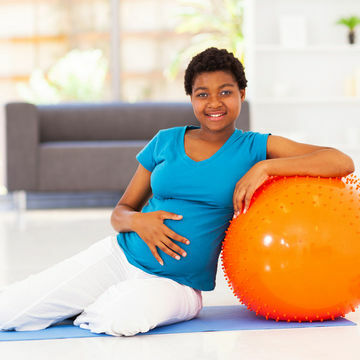 Although Pilates is one of the safest workouts you can do when you're expecting, be sure to check with your doctor before you begin this or any workout program. Warm up by doing five to 10 minutes of knee lifts, low-back stretches and shoulder rolls. Then do the moves specific to your trimester three to four times per week, taking one day off in between workouts. Rest in between each set if needed. These moves will strengthen the pelvic-floor muscles as you keep your pelvis, spine and hips mobile, relieving discomfort and preparing you for labor. Start now: Here's a prentatal Pilates workout that's great for every trimester.